In this Breach Class Tier List we provide Class rankings based on the current meta and our personal experience. Is the third-person co-operative action RPG set to be something special? Breach is the illegitimate love child of Dauntless and Left 4 Dead, with some infidelity accusations thrown in from the MMO genre. Having had the good fortune of playtesting the game with some of the studio several weeks ago, no only did I have a lot of fun, but there’s undoubtedly a game here that has the potential to be something truly special. 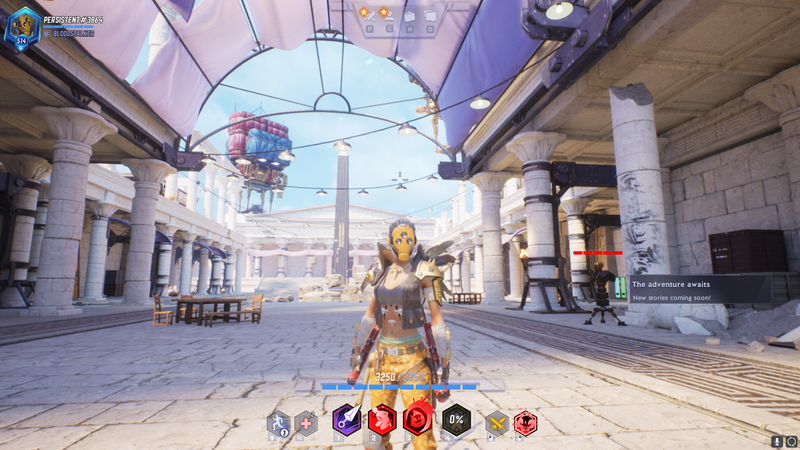 For anyone who hasn’t ever heard of Breach, it’s a third-person co-operative action RPG, that places an emphasis on multiple classes and immediate dungeon crawling. Breach is unlikely to be a big entry in the esports market, but New casinos are always looking for new titles, so you never know. To mix things up, it also throws in a player or AI controlled enemy, known as a Veil Demon, that looms large over all the scenarios you run, who’s purpose - alongside you undertaking various objectives and boss encounters - is to foil your success. On paper it sounds straightforward, and if you’ve ever played either of the games mentioned above, you’ll feel right at home very quickly. What separates Breach from its peers however, is that it’s attempting to do things rather differently. It wants to grab your attention and to keep you playing right from the get-go, and with the design decisions QC Games have taken, they may have also ensured its long term player retention. If I can digress a little, Breach and Dauntless share many design similarities: they both dive straight to the meat of the MMO genre, are third-person, have limited action sets, have a hub location, and scenarios (or missions) which you and your team travel to. The key difference however, is that I really didn’t enjoy Dauntless. It’s a game that does many things right, but misses the fundamentals of its design decisions so spectacularly that it collapses in a heap, before it’s even jumped off the airship. Behemoth encounters quickly become repetitive, there’s nothing for the player on the run-up to them, combat is a ball-ache of tiresome combos, and use of any weapon - against any creature - lacks tactile feedback. Simply put, if you’re to design a game that cuts away all the baggage that typically comes with the MMO genre, and leap ahead to pure boss encounters, those encounters ought to be bloody spectacular. In Dauntless, they’re enough to bring on a bout of narcolepsy. Where Breach is concerned, there’s no combos, itemisation is horizontal rather than vertical, and loot, despite the game being a sexxed up dungeon runner, isn’t at the forefront of its design. While that might make the hairs on the back of your neck stand on end, especially if you’re a hardened MMO player like myself, it really shouldn’t. The likes of Guild Wars 2 has done horizontal progression incredibly well, and despite some furor surrounding its original implementation of Ascended armor, people keep playing for, well, fun. That concept of playing a game for nothing more than enjoyment, rather than the continued treadmill of watching arbitrary stats increase is anathema to some, and yet it shouldn't be. Games which place itemisation at the heart of their design (such as WoW or Destiny 2) bombard players with bags of tat in an effort to satiate the need for a carrot. Even upon reaching said carrot, it’s never enough. Not only does that create a great deal of stress on developers to ensure the treadmill keeps running, but it also alientates those who just want to dive in and play. Having been turned away from many a dungeon or raid groups in my time, because my item level wasn’t deemed high enough, I fully understand why QC Games made such a choice. Some of the creatures you'll play as, or fight against, are truly stunning (terrifying). To be able to load Breach, select one of 18 classes, and dive straight into a dungeon (which lasts around 15 minutes), is refreshing and devilishly moreish; there’s no pressure to play every waking moment to keep up with those around you. Such an approach, combined with its horizontal progression, may make Breach sound like a casual game. This may be true to some extent, but certainly not to the detriment of it. Breach’s depth comes largely from the classes you and your team choose, the Talents you select during a dungeon run, and the Veil Demon you’re up against. Not only that, but there’s also a need tailor your class and its abilities to maximize your team synergy. From only some brief hands-on time with the game, min-maxing and choosing the right draft for the encounter looks set to define success. On the topic of classes and abilities, each has a traditional archetype (Tank, Support, Specialist etc), but these are also broken down into schools (such as Arcane or Dark, for classes like the Arcane Mender and Necromancer, respectively). Leveling up past 4 grants you the opportunity to swap abilities in and out for your class, only from their school. Having played the Necromancer, a class which wields a scythe and bombards opponents with undead summons, I could - in theory - take abilities from the Lich in order to create a hybrid between the two. There’s no requirement to do so, but it’s a layer of customisation that creates a great deal of scope for dealing with demons or bosses. Use of such ability exchanges are likely to be meta defining, and it’s certainly an exciting prospect to see which combinations rise to the top. The veil demon in all its glory, accompanied by its Elite Creatures. I’ve briefly mentioned above the Veil Demon and this is where Breach dips its toes into Left 4 Dead territory. During the “draft” before embarking on a mission, players not only choose their class, but an opposing player (AI or human) chooses two Elite Creatures, and a Veil Demon. The Elite Creatures are all from global mythology, and range from the likes of Bastet, to the obscure Kikimora (a slavic nightmare creature). Each has unique abilities, and like a class, has specific uses. 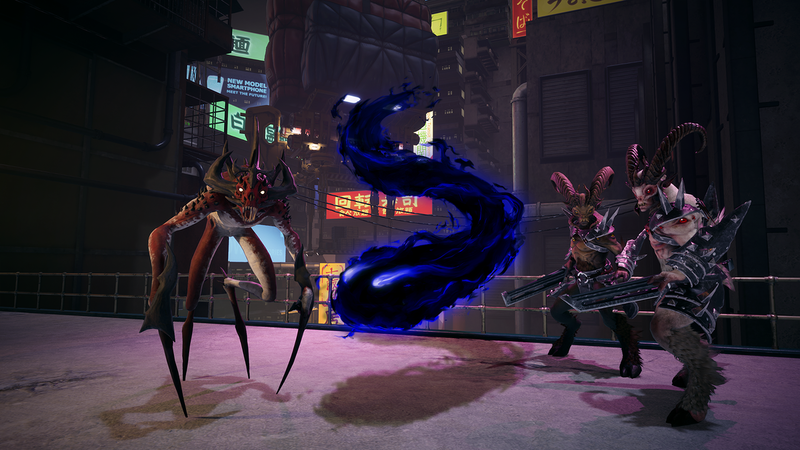 As an example, Bastet deals high damage quickly and is capable of stealthing, allowing you the opportunity to ambush unsuspecting players as they worm their way through a map. In contrast, Kikimora is slow but oppressive, with her having the ability to stomp and isolate enemies in a trance-like grip. The principle behind use of each Elite Creature isn’t just to deploy them, but to slow the opposing team down to ensure they miss or fail their objectives. As a Veil Demon, you not only get to draft which Veil Demon you want (each of these also has their own sets of abilities), but you can move around the map freely. Effectively, you’re an untouchable spirit that the opposing team can see, but they can’t interact with. Instead, you (as the Veil Demon) can litter their path with traps, spawn enemies, or teleport Elite Creatures in to fight them. Once you have, you can not only hamstring their progress, but possess the Elite Creature to really turn the screw. With five of us playing (4 humans / 1 Veil Demon) I have to admit I haven’t laughed so much in such a long time. Trying to survive while being bombarded by enemies and creatures, while still trying to complete objectives and work your way through the map was frantic, challenging and seriously funny. Played with friends, there’s absolutely no doubt that there’s something magic about Breach. The dynamic nature of play that a human controlled enemy brings, especially when their arsenal is filled to the brim with abilities that can ruin your fun, is something that the likes of Dauntless simply lacks. You might be playing over (for now) the same handful of missions, but they’re all vastly different due to your opponent, and their chosen draft of creatures. From the UI to the character models and classes, the game looks and runs brilliant. Many of the missions currently offer a linear path (like any dungeon I suppose) and while there’s undoubtedly scope to expand their depth, those that I’ve played not only look great, but are also a great deal of fun, with boss encounters that at higher difficulties, prove incredibly challenging (especially when against a skilled Veil Demon player). Whether it’s the run-down city of Tokyo Breach, or the desert sands Giza, there’s enough biome diversity to keep your attention. If QC Games can deliver new mission regularly, but supplement this with a frequent delivery of classes, players are bound to stick around. If I’ve any concerns about Breach, it would probably be in its Gear system, and a lack of emphasis on triumph. It’s early days in development, and despite its polished state (the Unreal engine really is a wonder), there’s no bombastic “ta-dah!” moment when you manage to win a mission. Downing a boss after a particularly challenging run - in the face of a tough Vile Demon opponent - should see your team loot a chest of some sort before the exit screen. Receiving your wards as a static image on the stats screen isn’t an exciting moment. Secondary to this, if progression is set to be horizontal, placing stunning cosmetic outfits and weapons as a carrot wouldn’t be a bad thing. Finally, the Gear system is a little confusing, as each item of Gear actually relates to a Talent you select during each round in a mission. These Talents work similarly to Heroes of the Storm, and bolster your character temporarily in one way or another. Some range from allowing you to dash more often, while others directly impact your basic attacks (the Necromancer is able to cleave multiple times with his Scythe, instead of swinging once). 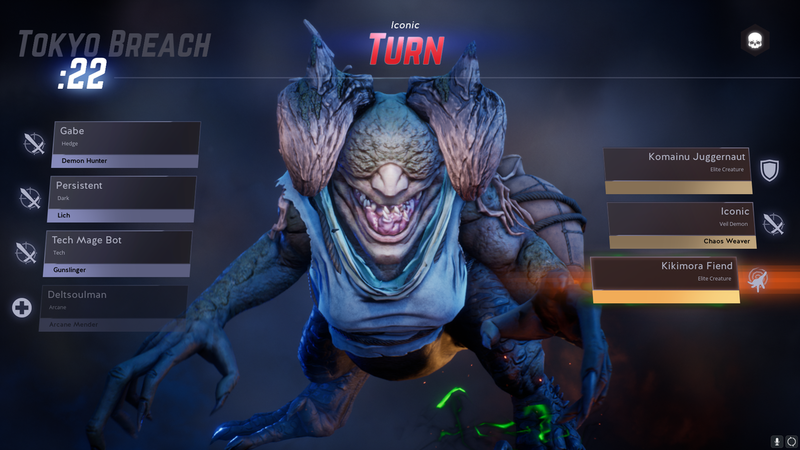 Considering you have to win objectives in each mission to access Talents and their respective tiers, renaming “gear” might be a sensible option. Better still, expand the system more. Why not have branching trees, or Talents that relate far more to your abilities? As one example, I’d have loved a Talent that allowed my Necromancer and his summons to cause an AOE poison when detonated, rather than them just exploding. Despite this being an early impressions piece, I absolutely loved my time with Breach and could see myself spending a lot of time playing it with friends. There’s something moreish about it, and many of the classes are enticing, and will scratch many an itch. Fingers crossed I’ll get chance to dive in again and explore the progress QC Games are making. Stay tuned. Interested in playing Breach? Earl Access is available now!